For the first time Kim Waldron will be showing the entire Beautiful Creatures project (produced between 2010 and 2013). 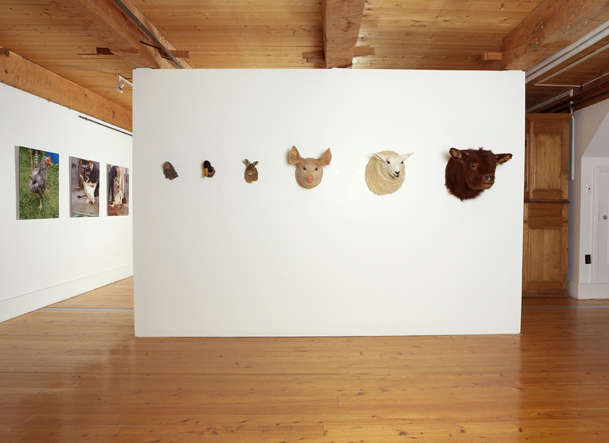 In order to understand how animals are transformed into the meat that we eat, during a one-month residency at English Harbour Art Centre in Newfoundland the artist Kim Waldron put herself in the shoes of the slaughterer, the butcher and the cook. Autopsie du mangeur (la suite) : la nourriture et la mort dans les arts et la littérature (in succession to ORANGE 2012) animated by Geneviève Sicotte, with Mélanie Boucher, Élise Desaulniers, Karine Hubert, Ianik Marcil and Kim Waldron. Librairie Raffin, 6330 Saint-Hubert Street, Montréal.